The HC Hydraulic Compactor is specially designed for compacting soil, roads, trench bottoms & footings. Additionally, these vibratory compactors can be used for inserting sheet piles, wood piles and facings. The compactor plates are made from the most durable HARDOX-400® with extremely high wear resistance. As a result, minimum maintenance is required and a long lifespan is assured. A double eccentric bearing guarantees exceptional strength and quiet operation of the compactor. The over-sized bearings are oil bath lubricated which guarantees a long lifespan. Special rubber pads reduce transmitted vibrations. Robust frame suitable for the toughest environments. 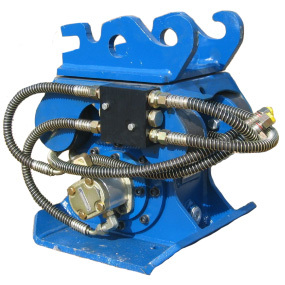 A dedicated pressure/flow valve ensures that the compactor hydraulics can’t be overloaded. Convenient and easy to use and works quickly. Can optionally be equipped with a hydraulic clamp for steel sheet piling. These hydraulic compactors are powered via the hydraulic hammer lines of the excavator. There are currently 8 models available for excavators from 1 to 38 tons.